FROM 3rd June to 30th August 2018 Sunday to Thursday from 9:00 am. to 1:30 pm. Of our operation and how it could be beneficial to your kids. • Swimming: Daily from 9:00 am to 10:30 am. 1- Session with instructors & group lesson 20 min. supervised by our lifeguard. (Sun, Mon, Wed, Thu) – Four days in a week. • Cooking & baking classes every Monday for Girls only. • Face Painting (Mon and Thu). 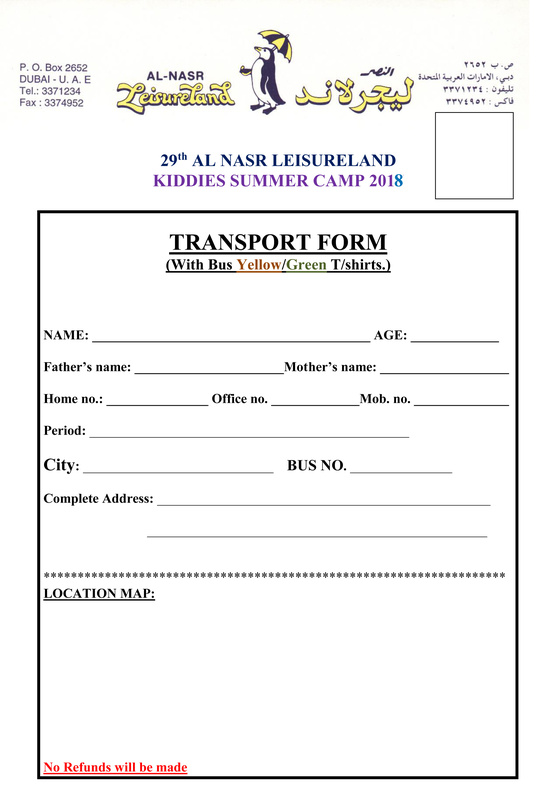 • Outdoor Trips: Every Tuesday outdoor trip, (Extra charges as per trip), if no outdoor trip kids have regular classes for swimming & skating. • Reading Quran for Muslim kids only. Kids from 3 to 6 years and without diapers are in separate classes & activities with Private specialists & helpers. The charges will be Dhs.1200/- per month including lunch & free Ice Skating. 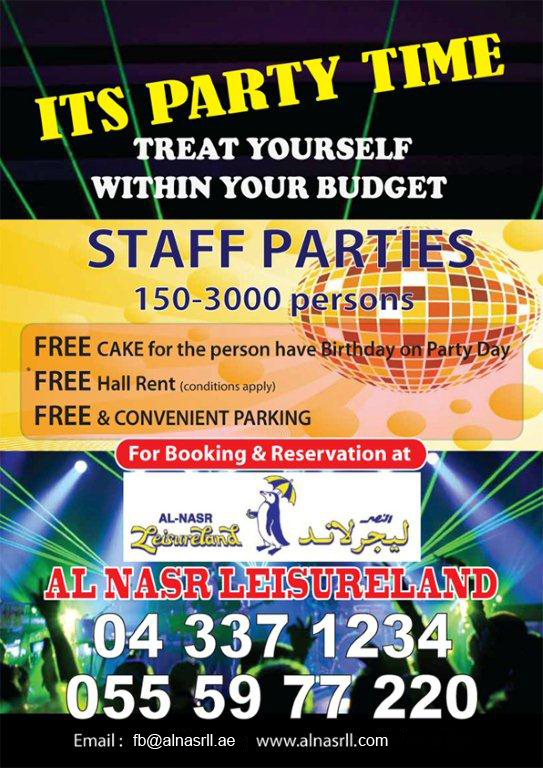 All this operations is managed by Al Nasr Leisureland with professional staff, teachers And instructors supervised by Duty Managers, Security staff. • Ice Skating : 12:00 nn to 1:00 pm (Two times a week)Skating timing can be change due to other school booking. • Rhymes, Stories with action & Drawing, Art & Craft. • Reading Quran for Muslim kids only, every day. • Outdoor trips only, Every Tuesday, (Extra charges as per trip). • Swimming & skating days is subject to be change according to the no.of Students. • Limited seats only for Crèche Children's. • 2 Passport size photograph. • Fill up Summer Camp application. • Fill up Transport application with clear address and map if required. • Registration starting from May 1st 2018.. (9.00am to 1.15pm) Summer Camp office, (3.00pm to 9.00pm) Reception. N.B. 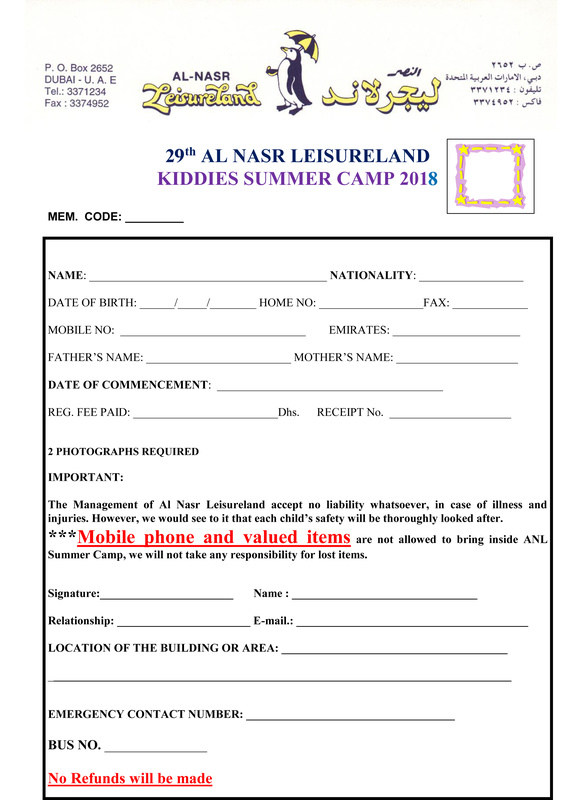 Application forms available at the Reception / the Summer Camp Office and you can visit our website: www.alnasrll.com. • No refund against registration. • Cancellation Charges: - 20% of the balance amount if any emergency cancellation is made after the registration. • Those who use our transportation must drop their child on the 1st day of the Camp. Yellow/Green T/shirt with bus. Red/Maroon T/shirts without Bus. • Students can join any day without transportation except Tuesday. • All are requested to register their child at least one day before.